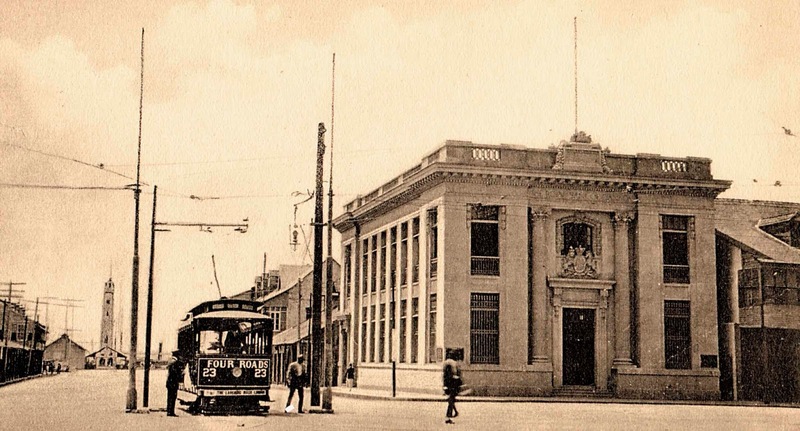 With the restoration of some historical buildings in Port-of-Spain underway, it might be useful to give an account of their origins and something of the history behind them. The one that comes immediately to mind is President’s House, or, as it was once called, Government House. other government buildings of Puerto d’Espagna. It may come as a surprise to some to learn that we have had, beginning from 1592, perhaps eight of these official buildings. 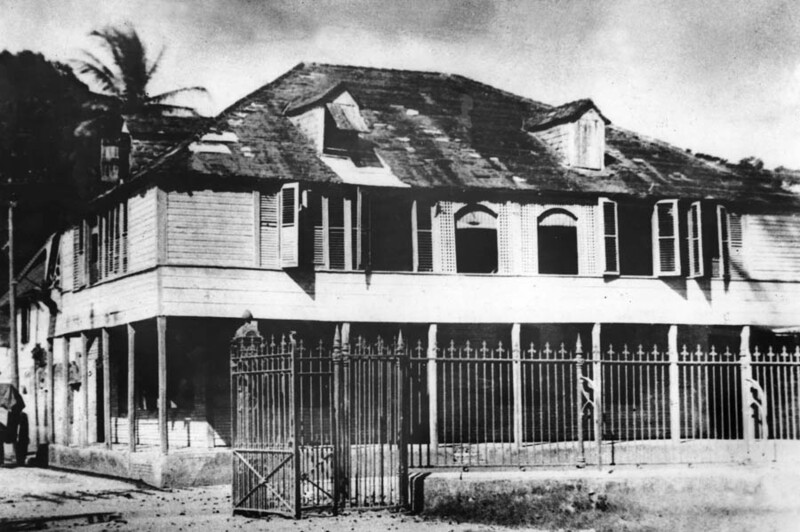 The first Government House was built in Trinidad by Don Antonio de Berrio y Oruña when he set up San José de Oruña (St. Joseph) as the capital. 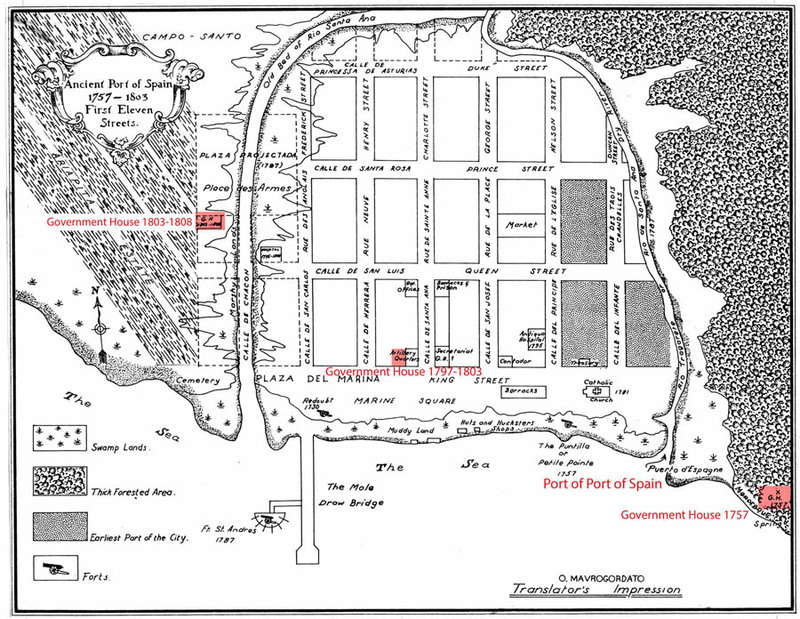 Like all Spanish towns, it was laid out with a central square, around which were placed the church, the Cabildo Hall or Town Hall, the residence of the Governor, and the prison. The church at St. Joseph, today, stands on the spot that was originally selected for it 426 years ago, which may makes it the oldest identifiable plot of land selected by government for the erection of a public building. (The church that stands there today is a newer building on the same location). 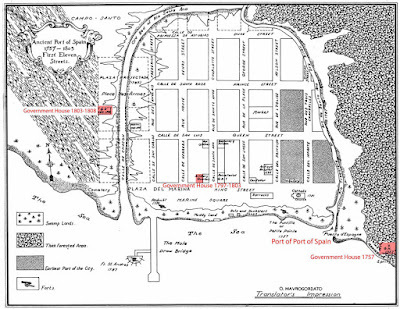 To the west and in front of the church was the open square, on the north side of which stood Government House. 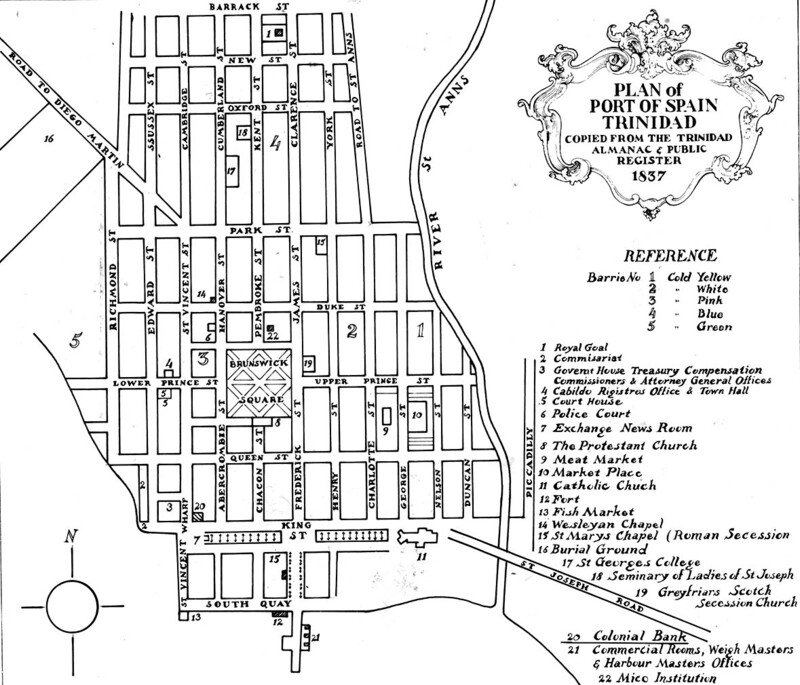 One hundred and sixty two years later, in 1757, another Spanish Governor, Don Pedro de la Moneda, for want of suitable accommodation at St. Joseph, decided to make the little port town of Port-of-Spain his home and in so doing put into place the moving of the capital from St. Joseph. In those days the town, which was really a fishing hamlet, not even yet a village, consisted of only two streets, which are now know as Duncan and Nelson. Nelson Street was called Calle Principe, Main Street, and Duncan Street was called Calle del Infante, Prince Street. At the eastern extremity of this very small place, across the river, was to be found the Governor’s house near to a spring of water called “The Spring of Madame Moncreau”. It was somewhere along the Eastern Main Road, probably in the vicinity of the present-day fly-over. 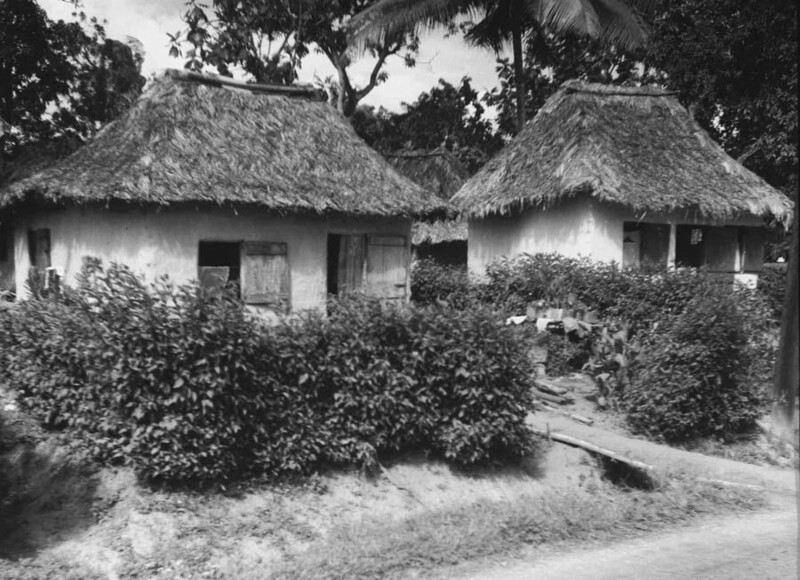 Ajoupas in the Piarco area in the 1930s. could have looked like in the 1780s. The Spaniards did not have stone buildings, so the Governor’s house would have been built of daub and wattle, that is rods or sticks laced with vines and covered with mud, white-washed, and thatched with a palm leaf called tirite. In those days, the port of Port-of-Spain was actually the mouth of the Dry River, and this was where ship’s boats landed passengers and goods. The entire sea front was covered in mangrove, looking like the Caroni bird sanctuary today. In 1781, the first church in Port-of-Spain was erected on the site now known as Tamarind Square, right next to the sea, and on the northern side, between Charlotte, George, Nelson and Duncan Streets, were the Artillery Quarters, the Secretariat, the Receiver General and the Treasury. This was the heart of town. In 1783 the population of the entire island stood at 126 Europeans, 295 mixed race ‘free’ people, 300 enslaved Africans, and 2,032 tribal people, making a total population of 2,753. The actual population of Port-of-Spain might have been a few hundred people. 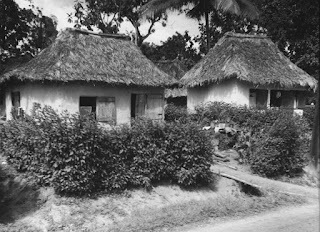 During this time, almost all the buildings in the hamlet, hardly more than forty or fifty, were ajoupas built of daub and wattle with thatch roofs, with perhaps one or two partially constructed from untrimmed lumber. The streets were dirt tracks that ended in either the mangrove or the forest. The area, forested, was characterised by the abundance of large silk cotton trees. It was called by the tribal people “Place of the Silk Cotton Trees”, Conquarabia or Cu-Mucurapo. Everyone went to bed—or rather to hammock—early, because with nightfall the place would teem with tens of thousands of crabs and with caimans that came out of the mangrove and ambled freely about, not to mention the very large boa constrictors making sudden and uncomfortable appearances. 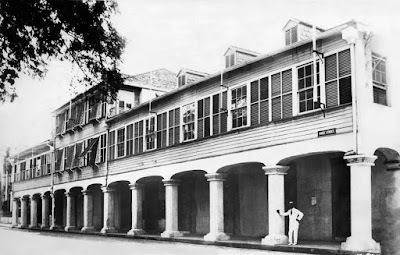 The course of the Saint Ann river swung westward around where Park and Charlotte Streets are, went along Park Street and down Frederick Street, across Woodford Square, then down Chacon Street, thence to the sea. The Dry River, mostly dry except for the duration of the rainy season, occupied its present course from Park into Piccadilly Street (which was once known as Arnold Street) to the sea at the first port of Port-of-Spain. The Saint Ann river would be diverted to run into the Dry River with the advent of Don José María Chacón, who arrived as Governor in 1784. Because of a Spanish imperative called the Cedula for Population of 1783, there had been an increase in the population, which required new public buildings. One of these was a new Government House, which was complected in 1788. It was situated on the northern side of the Plaza del Marina or King Street near the Artillery Quarters on the south-west corner of Charlotte Street. King Street later became Marine Square, now Independence Square. 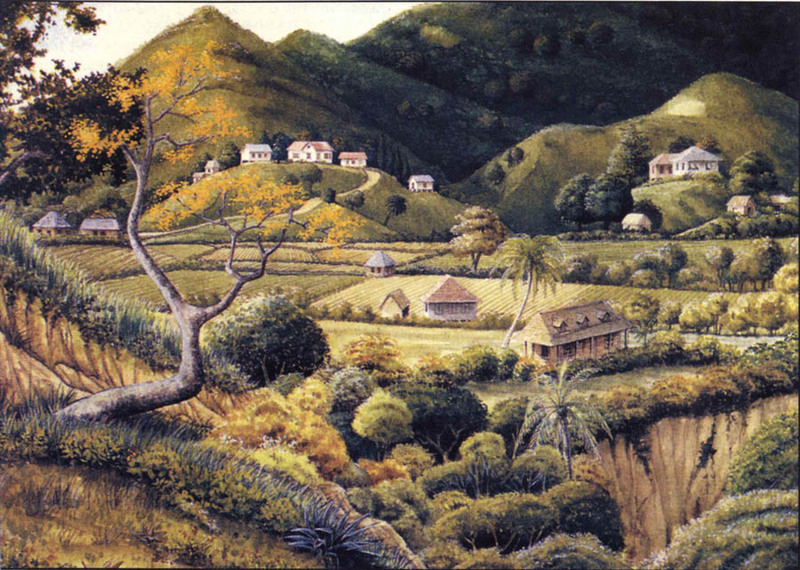 With the conquest of Trinidad by the British in 1797, a new government was established. 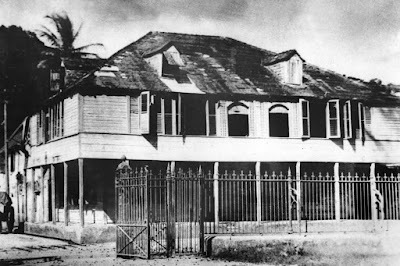 The first British Governor, Colonel Thomas Picton, lived in the old Spanish Government House near the south-west corner of Charlotte Street and King Street, until for a variety of reasons in 1803 a Government House was created at 29 Brunswick Square, now Woodford Square. This would be on the north-eastern corner of Knox Street and Pembroke Street, where the old public library building now stands. In 1808 a fire, which started at 12 Frederick Street, swept through the town, destroying almost all of it. used by both Governors Chacon and Picton. It was demolished in the 1960s. 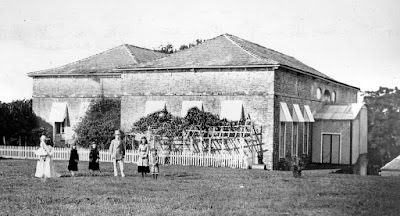 A new Government House had been selected in 1803 at Belmont Hill, where the Hilton Hotel now stands. It was an estate house belonging to an Irishman named Edward Barry (whose grave is in a little park at the top of Norfolk Street in Belmont), which was a plantation that belonged to him and a gentleman named John Black. By this time the population of Trinidad stood at 2,361 Europeans, 5,275 mixed race ‘free’ people, 20,464 enslaved Africans and 1,154 tribal people. Making a total population of 29,254. In 1818, negotiations were opened with Henri Peschier for a property of over 200 acres at Saint Ann, which was eventually purchased for £9,160 Sterling. 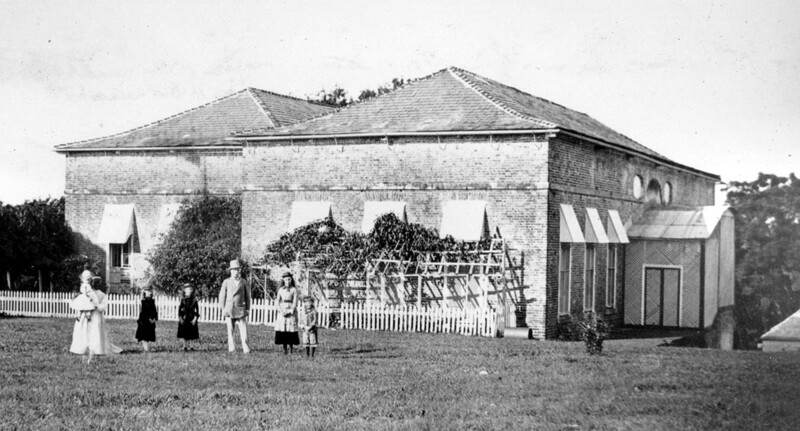 The new Government House was completed in August of 1820. 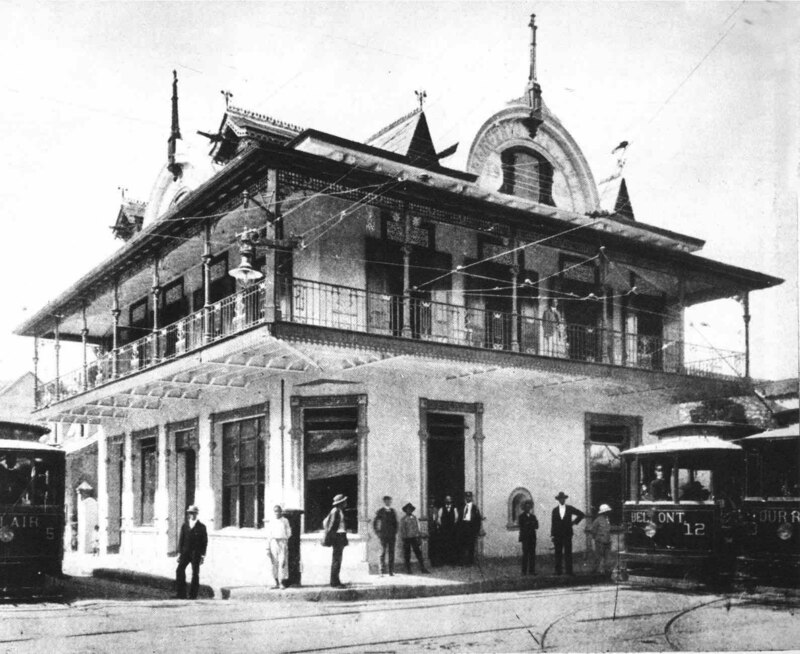 The building was situated a little in front of what is now President’s House. 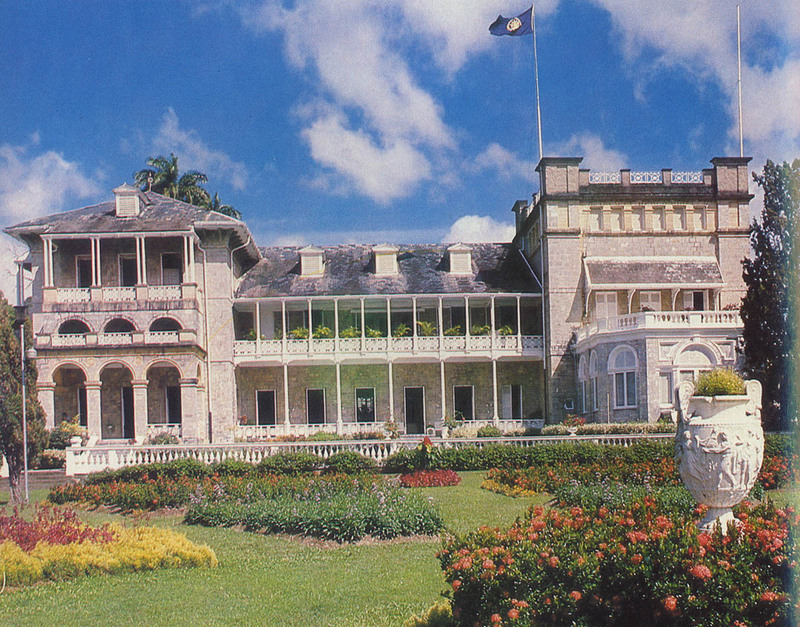 It continued in use as the official residence for ten Governors until in 1867 it was destroyed by fire. Government House on Belmont Hill, middle building. Painting by Peter Shim from a contemporary watercolour. Government House on the corner of Pembroke & Knox Streets. This was the estate manager’s office and residence from before the sale of the property. It was utilised as the Governor’s residence for nine years, from 1867 to 1876, by four Governors. 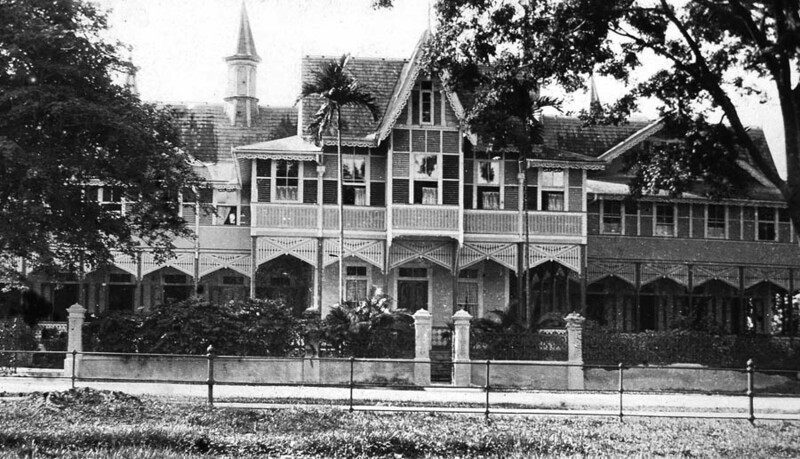 The well-known travel writer Charles Kingsley wrote his famous book, “At Last—A Christmas in the West Indies” there. It was eventually demolished in 1886. 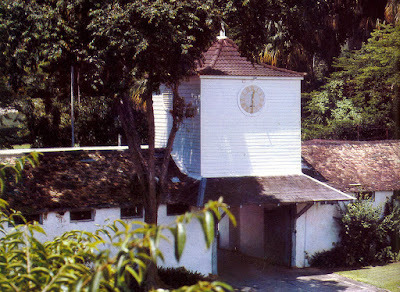 The old stables, now garages with a clock dated 1821, are the last remnants of the original buildings. little in front of where President’s House now stands. the hillside behind. Painting by Michel-Jean Cazabon. 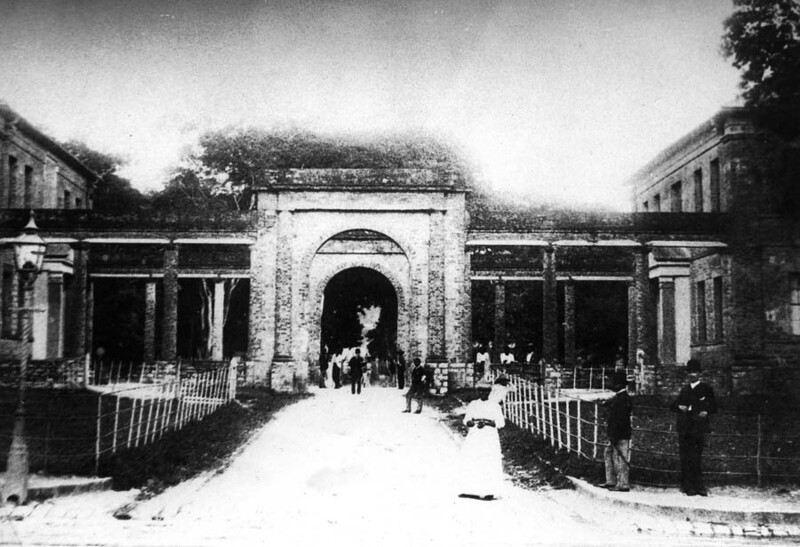 In July of 1876, the foundation stone was laid for a new Government House, which was built on the present site. It was designed by a Mr. Ferguson on what was called the Indian model and built of limestone at a cost £44,630 Sterling. Sixteen Governors lived there until it was almost entirely destroyed by fire in 1938. 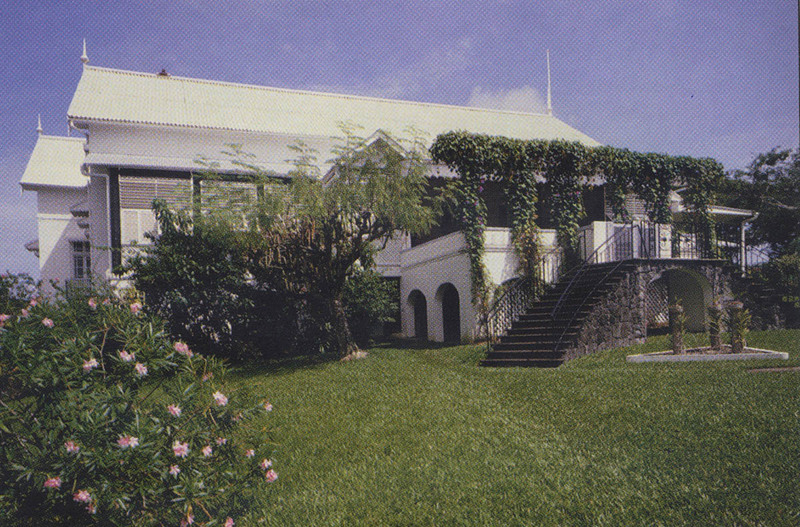 Rebuilt and modernised, it served as the residence for the last five British governors until it became the home of the Governor-General of the Federated West Indies on 30th of April 1958, when Lord and Lady Hailes took up residence there. The Federation came to an end on the 31st May 1962. Trinidad and Tobago attained Independence on the 31st August 1962 and the building was declared open as a museum and art gallery by H.R.H Alice, The Princess Royal. 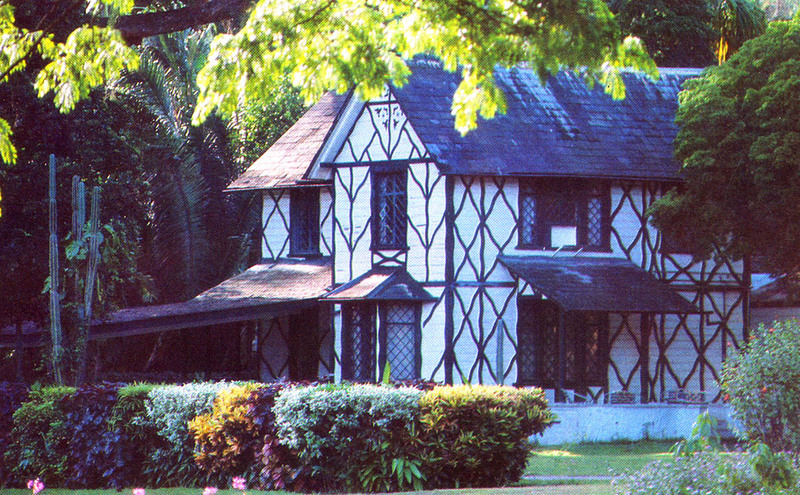 In 1965, Sir Solomon Hochoy was appointed the first Governor-General of Trinidad and Tobago and took up residence in the renovated Governor-General’s House. The renovations cost the government some $650,000. On the 24th September 1976, when Trinidad and Tobago became a Republic, the Governor-General’s House became the residence of the President of the Republic of Trinidad and Tobago, His Excellency President Ellis Clarke, our first President, and it is now know as President’s House. Sir Edward Beetham, the last English Governor in Trinidad. Tobago, from a western European perspective, possesses a longer and far more dramatic history than its sister island Trinidad. This may easily be recognised in its architecture and the remnants of its plantation economy, as seen by the windmills and water-wheels, which was driven up until the 1830 by African slave labour. British colonial administration in Tobago began in 1763. 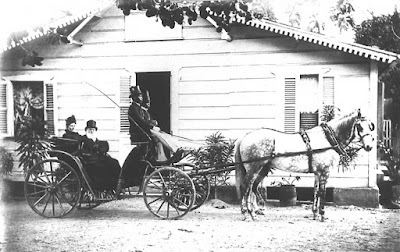 The island was divided into seven parishes, and land was sold to prospective sugar planters. African enslaved people were introduced, and thus began the cultivation of sugar, cotton and indigo. In 1764, the first Lieutenant Governor, Alexander Brown, arrived and settled at Fort Granby, near Studley Park. 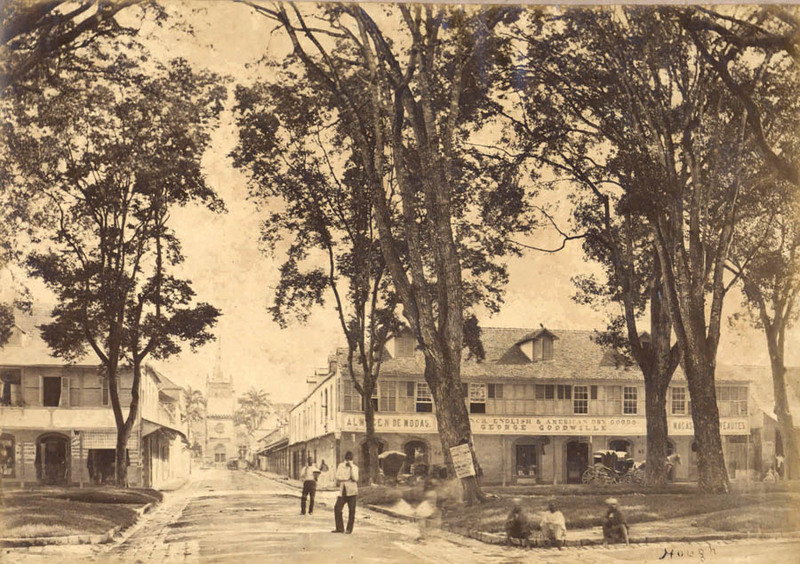 Georgetown, situated in Barbados Bay on the southern coast, became the capital from 1764 to 1789, when it was moved to Scarborough which was considered to be a more healthy place. In the early days, the Governor and his staff lived for two years on board two hulks anchored in Barbados Bay. From 1769, during the British occupation, it is recorded that the home of the Governor was situated at Orange Hill. 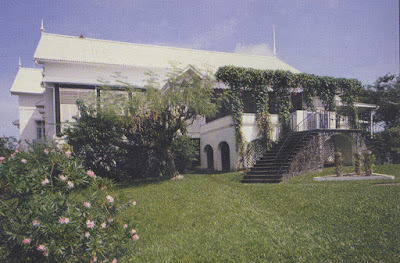 In 1802, during the French occupation, the Governor having died of fever, it was suggested that Government House should be moved to a more healthy part of the island, and it was decided to build the new residence at Mount William. 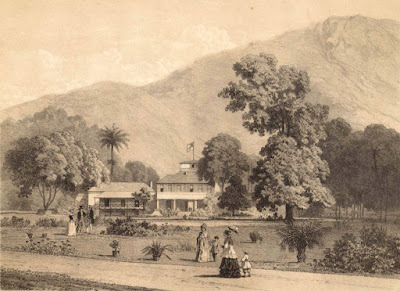 The house and lands at Orange Hill were sold at auction, and construction of the new building commenced and was not completed until 1807, at a cost of more than 25,000 pounds. From 1803 onwards, Tobago was to remain British. In 1807 Sir William Young arrived and was the first Governor to occupy the new buildings. The original plans were for a two-storied building, but when the post of Governor was reduced to that of Lieutenant-Governor, the House of Assembly built a house of one story instead. 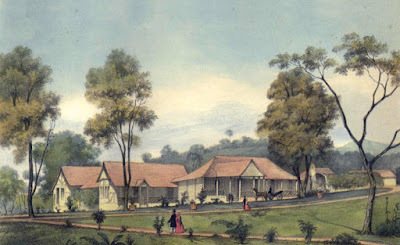 The present Government House stands on the same site today having been built and completed in 1828. 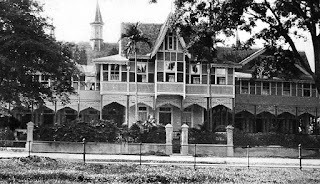 In 1958, at the time of the Federation of the West Indies, when Government House in Trinidad became the seat of the Governor-General of the West Indies, Sir Edward Beetham-Beetham, the last English Governor of Trinidad & Tobago, moved over to Government House in Tobago, where extensive repairs had been carried out at a cost of $45,187. Government House in Tobago has been the residence of Governors and Governors-General for many years, and will now be for the use of the President of the Republic of Trinidad & Tobago. Many distinguished visitors have occupied or visited it, including Her Majesty, Queen Elizabeth II and H.R.H. Prince Philip, as well as many celebrities too numerous to mention. Streets, Roads and Lanes, Alleys, Avenues and Boulevards: they surround us, frame our lives and echo memories of long time days. Their names, and the circumstances of their naming, delineate important chapters in our historical narrative. Like milestones, they mark our journey through time, while allowing us to understand the societal and cultural road travelled. 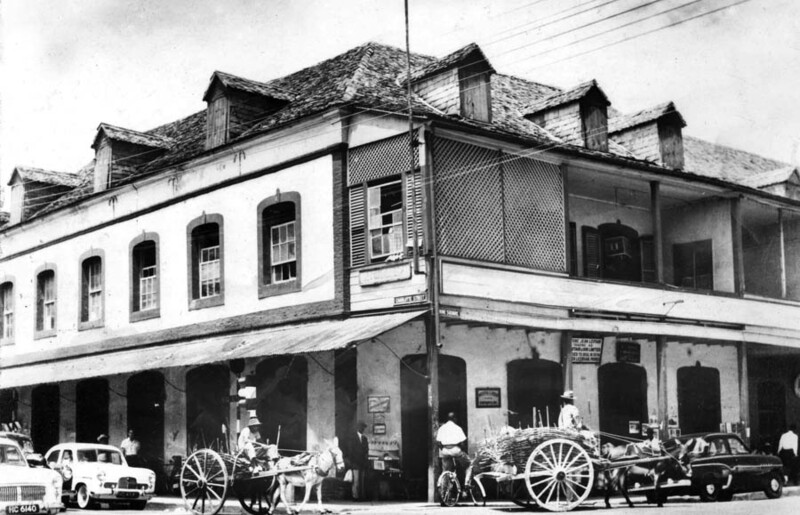 The early streets in Port-of-Spain are good examples of all the above. 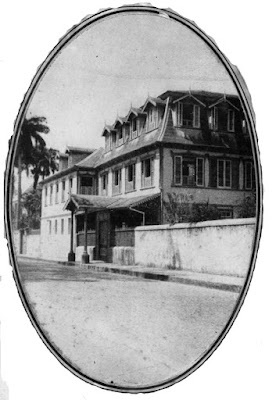 By the 1800s, largely because of the Spanish proclamation of the Cedula for Population of 1783, Port-of-Spain had changed from a fishing depot in a mangrove swamp to something of a little town of four or five hundred houses with a population of perhaps three thousand, one third of whom were French and Patois speakers. Independence Square, formerly Marine Square, looking west. The Royal Bank of Canada; on the right is the foot of Frederick Street. 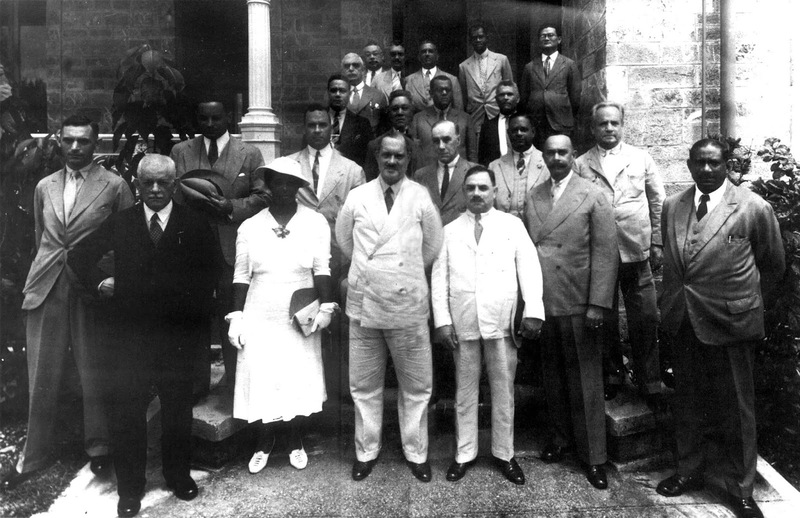 This was the case because in a population of about 29,254, of which there were some 5,275 who, as free citizens, were classified, under the Law, as Free Blacks and People of Colour.Of these, 2,925 spoke French, having come from Grenada, St. Lucia, Dominica, Martinique and Guadeloupe, with a few from as far away as Haiti, many fleeing the French Revolution of 1789. Others in that category numbered 1,751 mestizos who spoke Spanish; the majority of these may have been locals, but with the down the islands traffic, there may have been many from Down-the-Main as well. There was a small English-speaking cadre of Free Black and Coloured folk of about 599 persons. The European population in the 1800s stood as 2,361, with 1,093 French-speaking, 605, Spanish-speaking and 663 English speakers. There were over 20,000 enslaved Africans who, at first, were brought by force from the other islands by the above-mentioned Europeans and Free Black and mixed-race people, but increasingly came from Africa as the result of the establishment of a plantation economy here, in which French and Patois was the lingua franca. 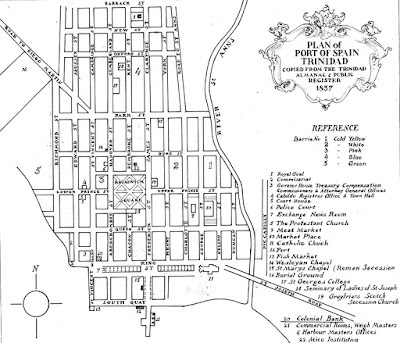 Spanish cultural dominance waned with the British conquest of Trinidad in 1797, and with the growing influence of the French and Patois speakers in Port-of-Spain in the 1800s, the street names of the town mirrored this social transition. For example, a street once known as Calle del Infanta by the Spanish became Rue des Trois Chandelles, called that by the French-speaking majority of the town because of the three candles which were lit at the gate of Lodge United Brothers, Les Frères Unis, on meeting nights. The Lodge was first established at the corner of Duncan and upper Prince Street in 1795. Duncan Street was named for a British Admiral, Adam Duncan, who defeated a Dutch fleet in 1797. For us, 221 years later, this may seem remote, even obscure, but as a piece of political propaganda, it was important to the English government in Trinidad, at the time of the Neopoleonic Wars, to send a message to the French citizens of the town of British Naval power. Same for Nelson Street, which was named for Admiral Horatio Nelson of the Battle of Trafalgar fame. That victory actually made Great Britain the ruler of the seas of the world for the next one hundred and fifty years or more. Nelson Street was known by the French and Patois speakers as Rue d’Eglise, because it led to the Catholic Cathedral on the Plaza del Marina, having been named Calle Príncipe by the earlier Spanish inhabitants because it was the main street of the town. George Street was named for King George III by the English, but had been called Calle de San José by the Spanish, and Rue de la Place by the French speakers because the Central Market was situated on that street. The Town’s Spanish street names were the first to be forgotten because of regime change and because hardly any Spanish speakers remained in the town, but the use of French names, although entirely colloquial, would linger into the early 20th century because of the quantity of French and Patois-speaking people living there. They would be eventually be replaced by the official English names. Seeing street names as a historical narrative, one can understand how Trinidad is a product of the French Revolution and the Napoleonic Wars. and today the BP building. Some streets were named in the search for common ground between the local political interest of those times, which tended to divide the population between Catholics—the French and Spanish-speaking inhabitants of all backgrounds, who were in majority—and the British Protestants, also of various backgrounds, who were in the minority, but were represented by the colonial power. An example of that is St. Vincent Street, which was named after St. Vincent de Paul. He was a French Roman Catholic priest who dedicated himself to serving the poor. St. Vincent is venerated as a saint in the Catholic Church as well as by the Anglican Communion. This was one of the relatively newer streets, running north to south and leading to the St. Vincent Wharf, Customs House, Signal Station and grass market. In so naming it, everyone was pleased. The original Royal Bank of Canada building. Knox Street, which runs from Frederick Street to St. Vincent Street, was named after Chief Justice William George Knox, and Hart Street, on the other side of Woodford Square, was named for Daniel Hart. Hart was, during a long career as a Public Servant, Superintendent of Prisons, Inspector of Police, Governor of the Royal Jail, Chief Sanitary Inspector for the Board of Health, and Special Magistrate under the Slavery Abolition Act, 1833, which abolished slavery throughout the British Empire. Frederick Street looking south from just below Hart Street. Charlotte Street was originally named Calle de Santa Ana because it led to the Saint Ann river. It was called by the French settlers in the area Sainte Anne. 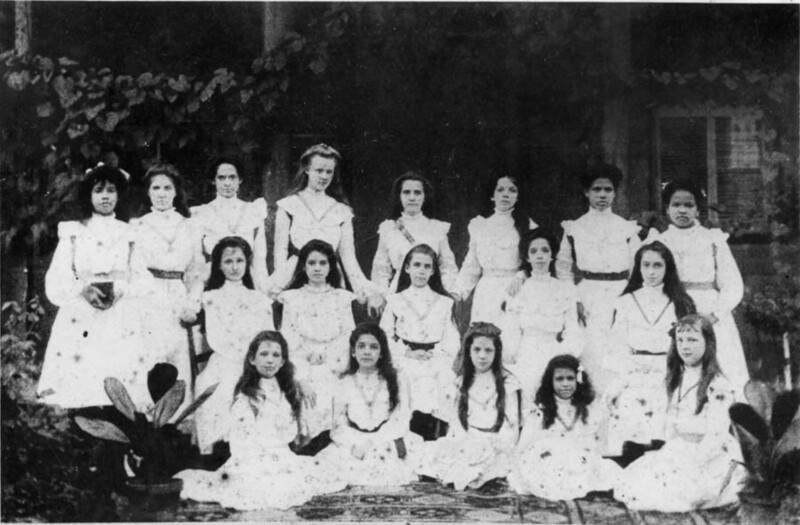 Many of them had arrived in Trinidad from the Bay of Sainte Anne in Martinique. The British, for political reasons, called it Charlotte Street after the wife of George III, Princess Charlotte of Mecklenburg-Strelitz. Port-of-Spain from the Harbourmaster’s tower, now gone. St. Vincent wharf before it was reclaimed from the sea. The building on the corner is the Alston’s building, now ANSA McAL. In much the same manner Henry Street got its name. Called Calle Herrera by the Spanish authorities in memory of a Chief of Police by that name, it was referred to by the French people of the town as Rue Neuve, meaning New Street. Henry Street came about because that was the name of Prince Henry of England. Calle de San Carlos, named after King Charles II of Spain, was rechristened Rue des Anglais, Street of the English, by the French citizens of the town—a tongue-in-cheek, or picoung, in memory of how the English sailors had fled when attacked by French republican insurgents during the last days of Spanish rule. The British named it Frederick Street, after Frederick, the Prince of Wales. 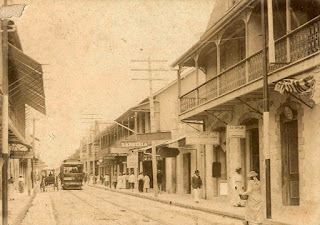 Calle de Chacon was named for Governor Chacon, who diverted the course of the Saint Ann river into the Dry River, thus creating Chacon Street. This street was not called by any other name. The streets that run from east to west in Port-of-Spain echoed, or reinforced, the names of the British King, Queen and Princes that were given to the north-south streets. These are Plaza del Marina, so named by the Spaniards because it bordered the sea. The early English colonists, putting the imperial stamp on the island, renamed it King Street, then Marine Square, and today it is Independence Square. Queen Street was called by the Spanish Calle de San Luis, Prince Street was called Calle Santa Rosa, and Duke Street Calle del Astuvias. Woodford Square was once Brunswick Square, named for the Dukes of Brunswick, allies and relatives of the British Crown. With the First World War and Germany the enemy, it was renamed for Governor Sir Ralph Woodford—the Germans were no longer our friends. However, before that it was described in old city plans as Plaza Projectada, because the Saint Ann’s river once ran through it. It was a marshy, somewhat unhealthy place, and there were plans to drain it. It was also known as Place des Armes, place of weapons, or Place des Ames, place of souls. This, because of a legend that in days gone by, before the Spaniards arrived, tribal worriors, Caribs perhaps, would gather there to fight each other as a demonstration and test of their manhood. looking north towards Trinity Cathedral. Abercromby Street was so named in memory of Sir Ralph Abercromby, soldier and administrator, noted for his services during the Napoleonic Wars. In 1796, Grenada, that had been overrun by French republican forces under the command of Julian Fedon, was suddenly attacked and taken by a detachment of the army under his orders. Afterwards, Abercromby secured possession of the settlements of Demerara and Essequibo in South America, and the islands of Saint Lucia, Saint Vincent and Trinidad. He landed his troops in Trinidad at Invaders Bay, close to present-day Movie Towne, and within days the island fell to the British after almost three hundred years of Spanish rule. The Transfer Station on the corner of Park Street and Frederick Street. 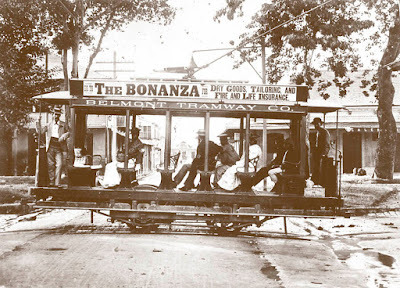 This was where you transferred from one tram to another.